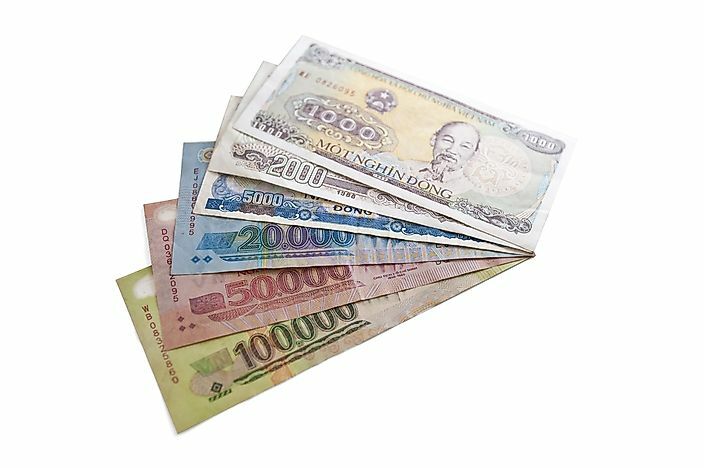 What is the Currency of Viet Nam? The official currency of Viet Nam is the Vietnamese đồng. The banknotes of the Vietnamese đồng all feature Ho Chi Minh. Vietnam is a Southeast Asian nation located in the easternmost part of the Indochina Peninsula. The country encompasses an area of 331,230.8 square km and hosts an estimated population of 94,569,072 individuals. The GDP (PPP) and per capita GDP (PPP) of Vietnam was estimated to be $705.774 billion and $7,463 in 2018, respectively. The economy of Vietnam has rapidly progressed in the recent years. The country has become a leading exporter of agricultural products. It also attracts a significant volume of foreign investments. The tourist industry of Vietnam is also growing quickly. The đồng is the currency of Vietnam. The name has been derived from a Chinese loanword referring to bronze coins used in China in the ancient times. The currency code VND and the symbol “₫" represent the Vietnamese đồng. The đồng was issued on May 3, 1978, by the country's main bank. Currently, the đồng has no subdivisions. At the time of its introduction, however, one đồng was equal to 10 hào which, in turn, was equal to 10 xu. These subdivisions have been discontinued. Prior to the Indochina Wars, the French occupied the region that is now independent Vietnam. Following the French defeat, Vietnam was politically divided into the two rival states of North and South Vietnam. The Vietnam War was fought between these two rivals to finally end in the victory of North Vietnam in 1975. North and South Vietnam now reunited to form one single country. During the colonial rule in the region, the French Indochinese piastre was used as the currency of the colony. However, the Viet Minh government established the đồng currency in 1946. The new currency symbolized that Vietnam was on the way to attain independence. The scenario was slightly different in the State of Vietnam (which was to become South Vietnam in 1954) where notes denominated both in đồng and piastres were issued in 1953. In 1975, following the fall of Saigon, the capital of South Vietnam, a new currency, the "liberation đong” was launched in the region. After the unification of North and South Vietnam as one country, the currency of these two regions was also unified as one. The new đồng was equal to 0.8 "liberation" đồng and one Northern đồng. The currency unification happened in 1978. Initially, aluminum coins were introduced in Vietnam. However, the chronic inflation prevailing in the country made the coins unpopular. For a long time, the use of coins in Vietnam became almost negligible. It was not until 2003 that the State Bank of Vietnam once more issued coins. The reintroduction of coins was made with the aim of replacing the small denomination banknotes. Coins were released in denominations of 200₫, 500₫, 1000₫, 2000₫, and 5000₫. Coins are hardly used in Vietnam in the present times. Since 2014, the coins are generally not accepted in retail and only a few banks in the country accept them. The banknotes of Vietnam were introduced as the first đồng in 1978 and the second đồng in 1985. In 2003, the cotton banknotes of the country were replaced with those made of polymer. All banknotes of the country feature the portrait of Ho Chi Minh on the obverse side. Banknotes are available in denominations of 1,000₫, 2,000₫, 5,000₫, 10,000₫, 20,000₫, 50,000₫, 100,000₫, 200,000₫, and 500,000₫. Banknotes of 100₫, 200₫, and 500₫ are also available, although rarely used. Ho Chi Minh, a revolutionary Communist leader of the Viet Minh independence movement, is featured on the obverse of all the banknotes.